HomeWhat are we REALLY seeing with the half-sword images of Talhoffer? The works of the master Hans Talhoffer are curious. He authored at least five fencing treatises in the 15th century, and while we know that he himself was a celebrated fencing master, none of his manuscripts are what we in modern times would call a “manual”. Twenty years ago, these works were some of the only treatises available to the modern practitioner (before the age of translators and martial artists working to revive as many treatises as possible), and, unfortunately, due to the incomplete knowledge at the time, many people have come up with bizarre and complicated explanations for what they see in the images. While this was understandable twenty years ago, there is no excuse today, because there are so many other known fencing treatises from the same era that explain many of the same techniques in far greater detail. Despite this, many people still rely on Talhoffer’s works as stand-alone pieces, ignoring the larger context, and this leads to some severe misunderstandings of what Talhoffer was actually illustrating. 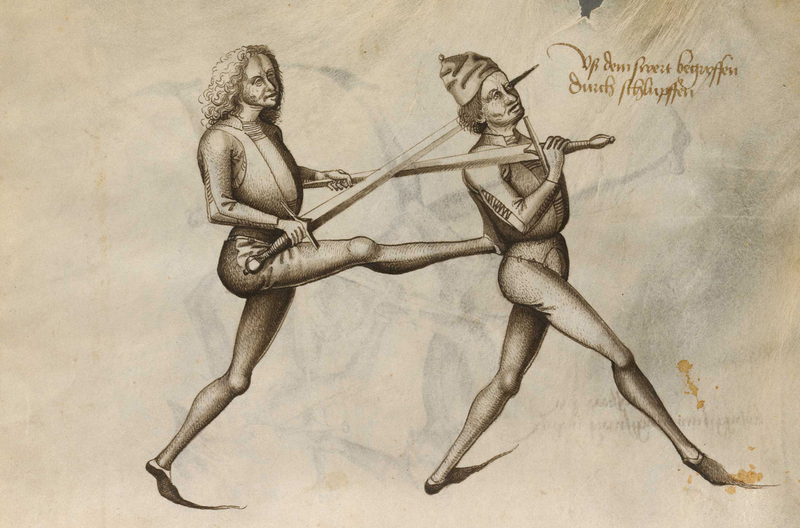 In particular, one of the many myths that have sprung from supposed students of Talhoffer in the modern world is that half-sword techniques and specialty moves such as the Mordschlag (“murder stroke”, a technique done by grasping the blade with both hands, holding the sword upside down to strike with the hilt) were normal, everyday techniques for unarmored combat, and that they were incorporated as much as possible. 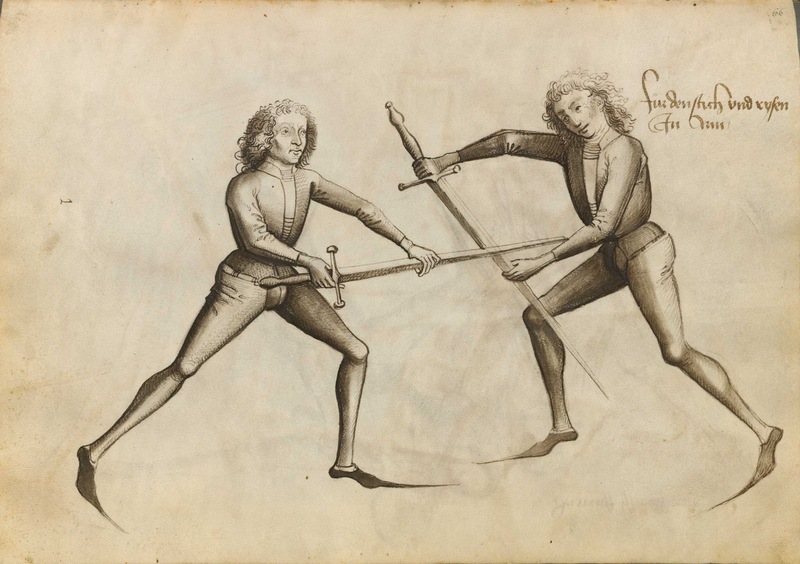 This is also usually accompanied by many misguided ideas as to why this must be “true”, such as “Talhoffer clearly was teaching fighting in narrow castle halls…”, “The swords of Talhoffer’s time were not sharp, so using them this way gave more control…”, “Half-sword techniques were just the norm for the time…”, but none of these arguments are based on any kind of logical evidence or critical thinking. 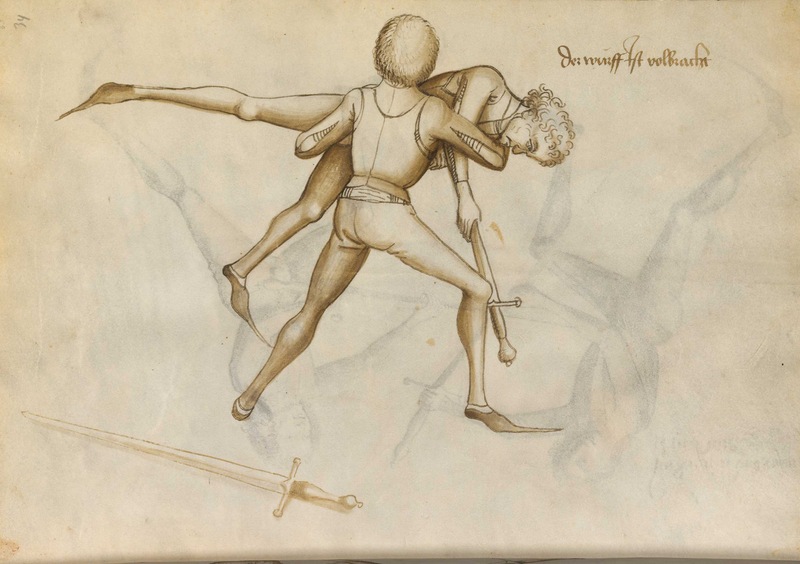 It is far more likely that Talhoffer’s images were meant to demonstrated armored combat despite the fact that his models were not wearing armor, and that conclusion is not far fetched when we look at the broader picture of 15th century martial arts. While Talhoffer’s works are primary sources, and while all primary sources are valuable to our reconstruction of Historical European Martial Arts, experienced practitioners have come to take the phrase “I practice Talhoffer-style” to be synonymous with “I don’t actually know anything about HEMA, but I sure pretend to.” It is a shame, because there is so much good material from Talhoffer, but that stereotype has persisted for good reasons. The books were heavily illustrated, but most of them have very little text to explain the images. 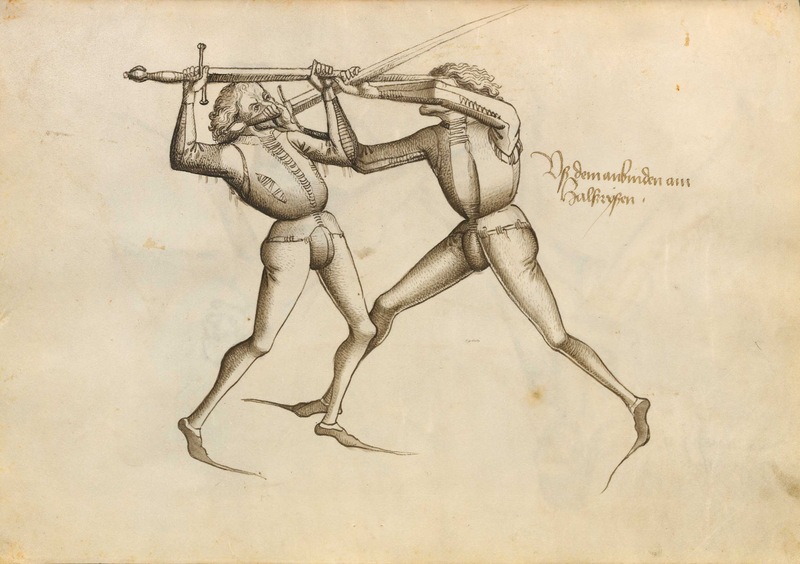 They depict fighting with various weapons, from mounted combat to the use of the poleaxe, and also depict scenes of Swabian forms of the judicial duel, but the illustrations rarely have more than a simple caption, and only a handful of images actually connect together to demonstrate cohesive techniques. The context of these treatises is left up to conjecture: Were these books meant as a teaching aid for Talhoffer? Did they serve as the medieval equivalent of a resume for him? Was there some other reason that Talhoffer had these manuscripts made? The lack of hard evidence means that we have to rely on making educated guesses. Talhoffer’s books are far from useless, however. We need to study them in the broader picture of the Liechtenauer tradition. It is not certain that Talhoffer was a master within the Liechtenauer school, but some of his terminology would suggest that he either taught within that tradition, or at least was part of a branch of Liechtenauer’s martial family tree (and in fact, his Thott manuscript of 1459 includes a copy of Liechtenauer’s teaching verse). If we use the much richer information found in the more text-based manuscripts, we can compare these to Talhoffer’s illustrations and often times understand what he was actually trying to depict. In many cases, it isn’t what many people think. 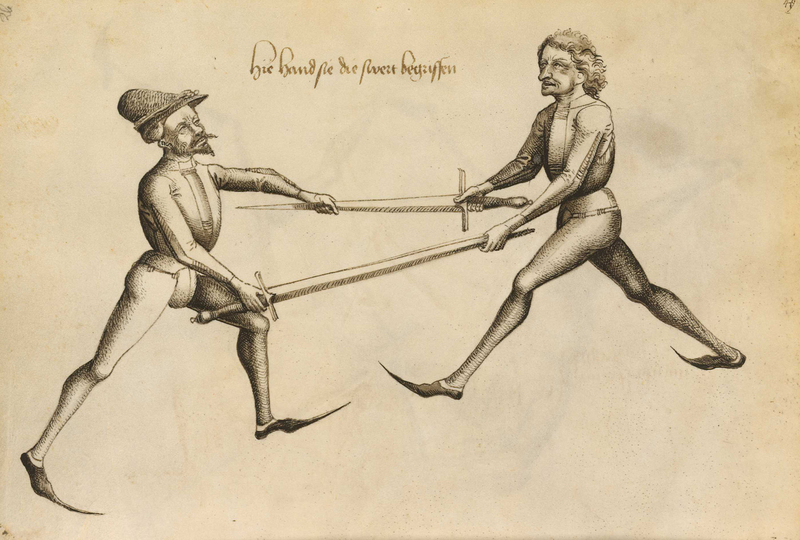 The aforementioned half-sword techniques in particular are shown quite often in Talhoffer’s work with fencers wearing normal, everyday clothing, yet this doesn’t seem to line up with the other texts. These maneuvers were intended primarily for armored combat. What were half-sword techniques devised for in the first place? 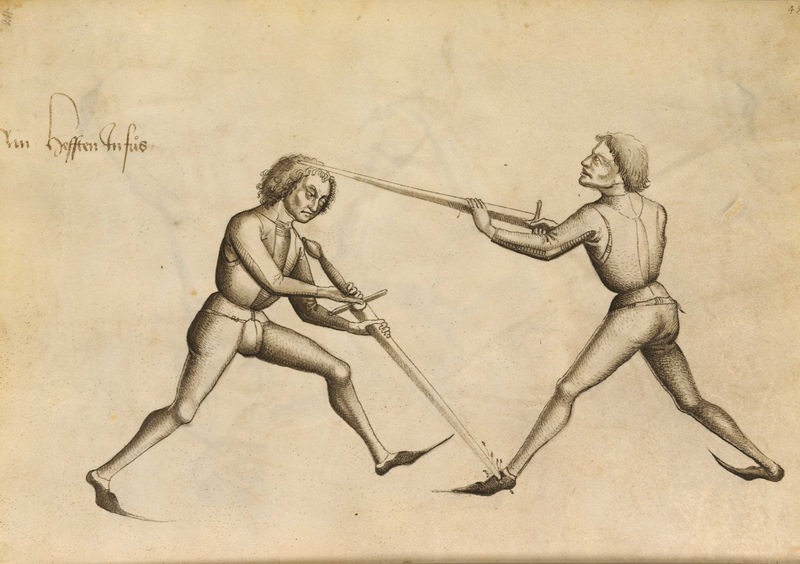 Before analyzing Talhoffer, let’s look at what half-sword techniques actually are within the larger context of medieval German martial arts. 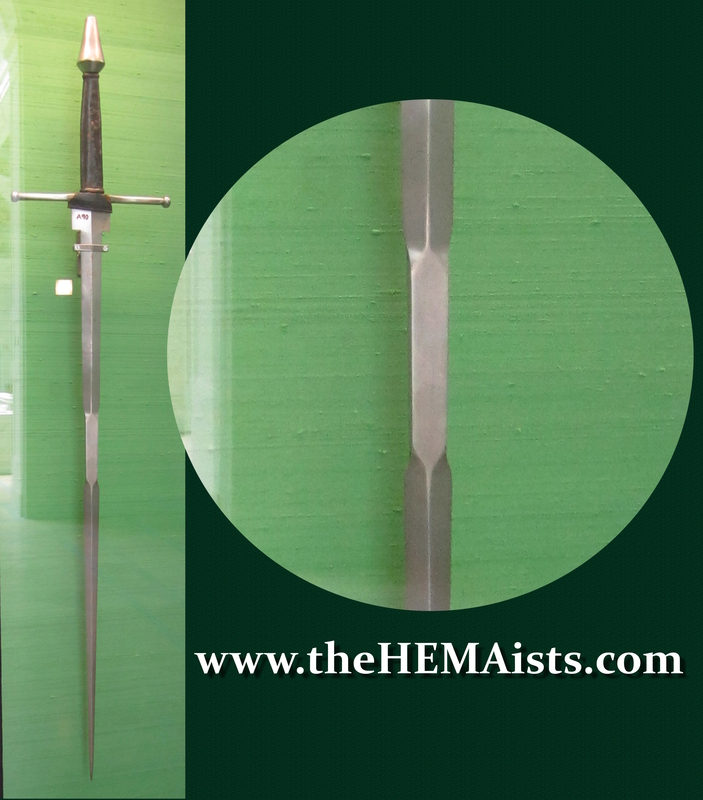 Going to the half-sword was, for the most part, a specialized technique used for harnisfechten, or fighting in armor (as opposed to blossfechten, or unarmored fencing). The treatises that detail this seem to primarily focus on the judicial duel between two armored knights (as evidenced by the “list”, or the fence surrounding the combatants drawn in many of the illustrations). Essentially, both armored combatants would be armed with longswords and would grasp the blade of the sword somewhere along the middle to use them similarly to short spears, thrusting into the small gaps and openings that their plate armor could not fully cover, and occasionally using them as levers to set up joint locks or to throw the opponent to the ground. The act of grabbing the blade was sometimes even called using the “armored hand”, reinforcing the idea that it was developed specifically for fighting in armor. Since both fighters would not have exposed skin on their hands and arms, neither would have had to worry about the opponent’s sharpened edge slicing them. So, does this mean people never used Half-Sword techniques without armor? We’ve already established that fighting while grasping the blade was a specialized maneuver for fighting in armor, but were these techniques used without armor, the way they are shown in Talhoffer? According the historical sources, it seems that the answer is “occasionally”. We always have to keep in mind that these arts were practiced as one holistic system, and not a smorgasbord of random techniques. Harnisfechten and Blossfechten were two sides of the same coin, and while some techniques are more specialized for one area than the other, the techniques for both styles overlapped a great deal. 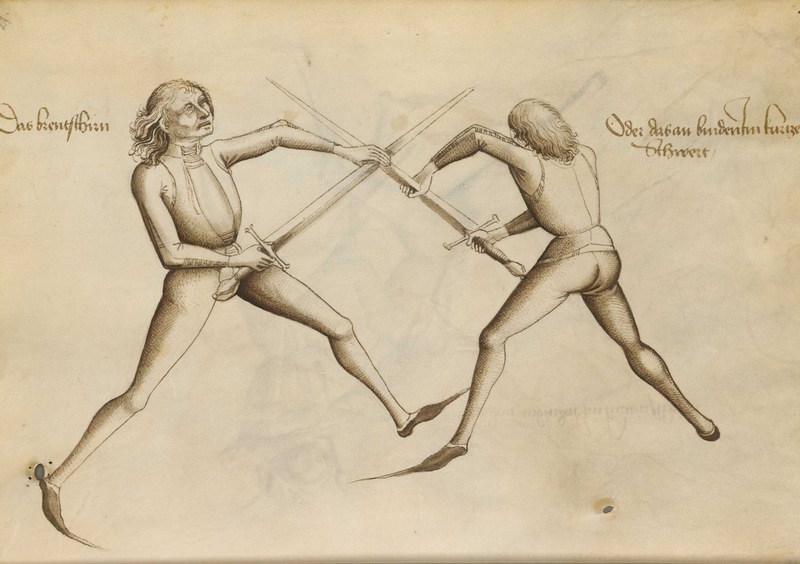 -Codex Ringeck (MS Dresden C 487), in the blossfechten longsword section on folio 35v, talks about taking off of a bind to strike to the other side with a Zwerchau where you are instructed to grasp the blade, stepping close to the opponent to thrust. Such a move allows you to fight at dagger range despite the length of the longsword. 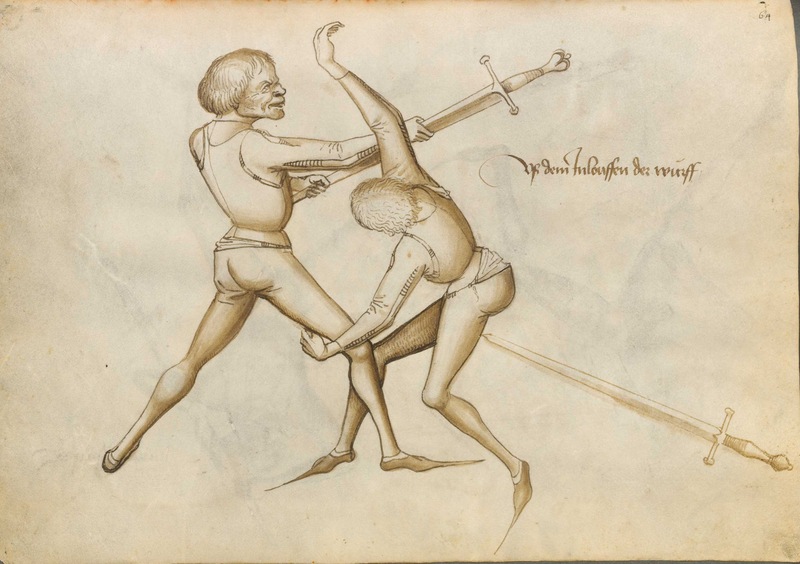 -The messer section of the Glasgow Fechtbuch (MS E.1939.65.341) on folio 26r gives a technique against an opponent who is striking down with a heavier weapon. In this case we are instructed to grasp the blade with the off-hand to support it whilst parrying, and then to step in behind the opponent and use the half-sworded blade to either thrust at him or throw the opponent over the leg. -Johannes Lecküchner’s Messerfechten, on folio 29v, instructs one to parry the attack on the hilt on the short edge side (using the Entrüsthau, one of his master strikes). Immediately you would spring to the opposite side, grasping the blade in the middle with the off-hand, and thrust in the half-sword position. He then instructs you to follow through with a Donnerschlag (“thunder stroke”, which is merely a synonym for the aforementioned armored technique, the Mordschlag). There are several other examples within the treatises of using these armored combat techniques in unarmored situations. Despite this, if we look at the proportion of half-sword techniques described in these treatises for Blossfechten, they seem to be the outliers. They do not make up a large portion of the techniques, and rarely are mentioned. This is most likely because by-and-large, it is much more practical to keep one’s unprotected hands on the unsharpened grip of the sword, behind the cross-guard that keeps one from losing fingers. Going to the half-sword in an unarmored context can occasionally be useful to gain the advantage, particularly when the opponent does not expect it, but using it as the standard move just doesn’t make sense. Wait. If the texts rarely tell us to use half-sword techniques without armor, then why does Talhoffer show so much of it? Coming back to Talhoffer, we have to remember that his treatises don’t appear to be true instructional manuals. In fact, we don’t really know what they are. There are some educated guesses, but ultimately the treatises are not organized as “how-to” books, or even books that were meant to give a broad outline to teach the art. The techniques are scattered with little logical order to most of them, no description of footwork or physical actions, and not even a description of why one should use one technique over another. 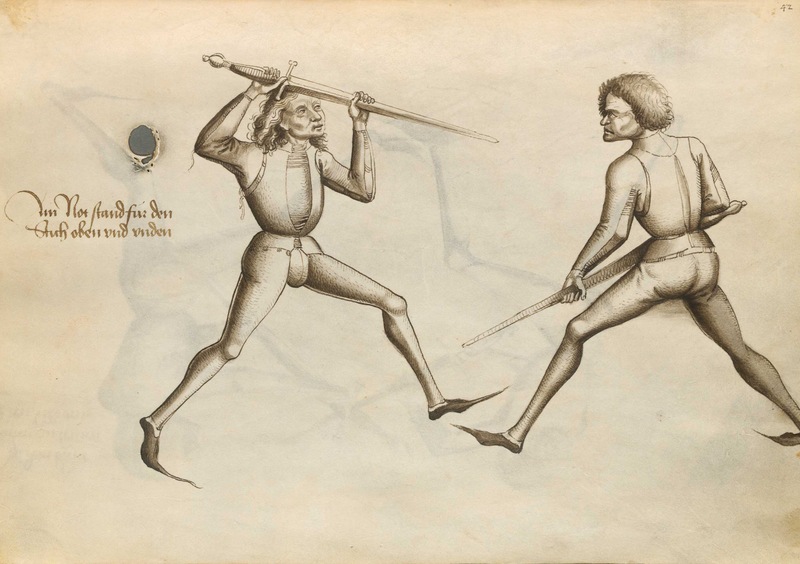 Rather than go through every single one of Talhoffer’s works (which may have all been produced for different reasons), let’s focus on the Württemberg Fechtbuch of 1467, as it starts out with a large set of images depicting unarmored fighters using the longsword (and it is arguably the most popular of Talhoffer’s manuscripts in the modern world). Up through folio 14r, there is no half-swording at all, so it is safe to say that these images are indeed depicting Blossfechten techniques. 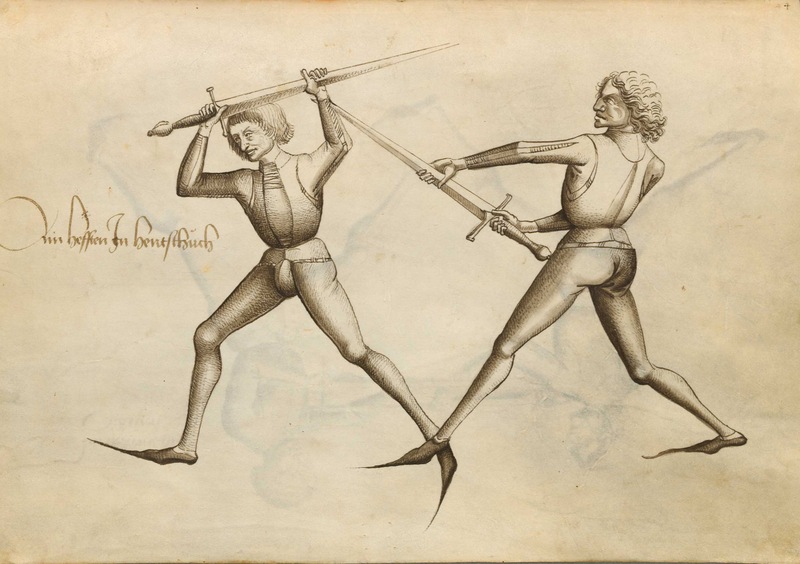 At 14v, we see our first half-sword technique, but it definitely appears to be an unarmored technique for disarming which is seen in other treatises (though it should be noted that Talhoffer calls it a “gewauppet Infallen”, or “armored in-falling”, referencing that the technique comes from armored combat). As the treatise moves on, we do see a handful of other “armored techniques” that have been adapted for unarmored use, just as with other fencing treatises of the time… but then we reach folio 20r, and things get crazy. At this point, the next 31 images all show men wearing normal clothing, but not a single person is using the sword in a traditional Blossfechten manner; Essentially everyone is grasping the blade. We have to ask, why on Earth would anyone fight like this with sharpened weapons? If an opponent stood in guard like this, couldn’t one simply grip the sword normally on the hilt to outreach him and easily slice his fingers off? People have made all sorts of strange, unsubstantiated justifications for this that are often stated as “fact”, though many of these justifications come from looking purely at Talhoffer’s illustrations in isolation and not at any other contemporary sources. If we look at the bigger picture, though, we can actually find depictions of these exact same moves written by other fencing masters but taught for armored combat instead. Below is short list of comparisons between Talhoffer’s images and the texts of other Liechtenauer-based masters of armored combat. While not every comparison is an exact mirror of each other, they show close enough similarities to be convincing that Talhoffer’s images are probably depicting armored combat within the same tradition, despite the fact that he demonstrated it with men who didn’t put their armor on. If we focus on what they are doing, and not what they are wearing, it seems very difficult to think otherwise. Note that this is far from an exhaustive list, particularly because many of the techniques are described in multiple treatises, which is more than this article will tackle. “Here begins the art of half-sword dueling in harness [armor], from four guards, by Master Martin Huntfeltz, God have mercy on him. Compare this to Paulus Kal’s work on 22v, where he shows a nearly identical pose with two men in armor. Item: thrust inside to his face. If he defends against that, then go through and thrust outside to his face. If he defends against that as well, and strikes your point aside, then wind your pommel over his right shoulder, spring with you right leg behind his left, and throw him backwards. Could the artwork reflect how the models were dressed rather than what the models were trying to portray? At 35v, Talhoffer switches to another section explaining the process of the judicial duel, and at this point his models are wearing armor. After the initial procession is illustrated, they demonstrate some techniques… but then by 38v (seven images in), the models are suddenly no longer wearing armor in the midst of their duel, yet have not stopped using armored combat techniques, and have no fear to having their fingers sliced off by the opponent. What gives, Talhoffer? “Yikes, I’m naked!” Perhaps the hero of the classic NES game Ghosts-N-Goblins, whose armor would fall off whenever touched by an enemy, was a student of Talhoffer? If we apply this same critical thinking to Talhoffer’s MS Thott.290.2 manuscript of 1459, we can see the same trend in the section on the armored judicial duel. 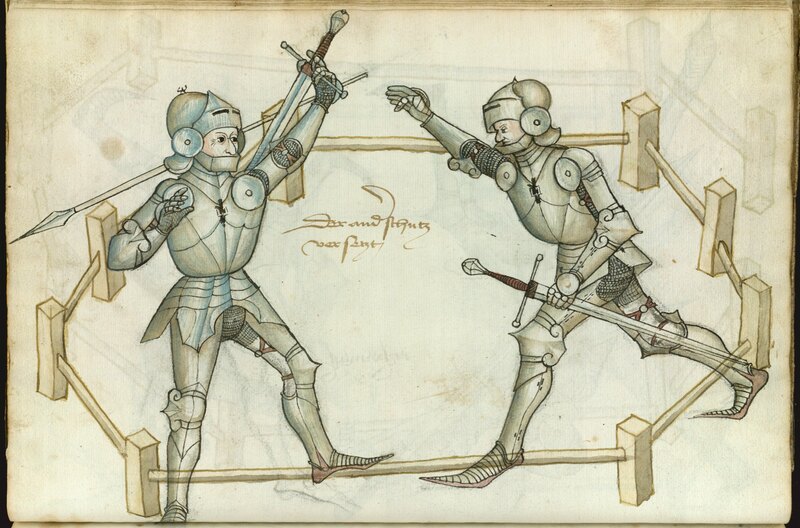 Starting at folio 84v, this section shows two fully armored men in entering the lists and beginning a duel with longswords in the half-sword position. 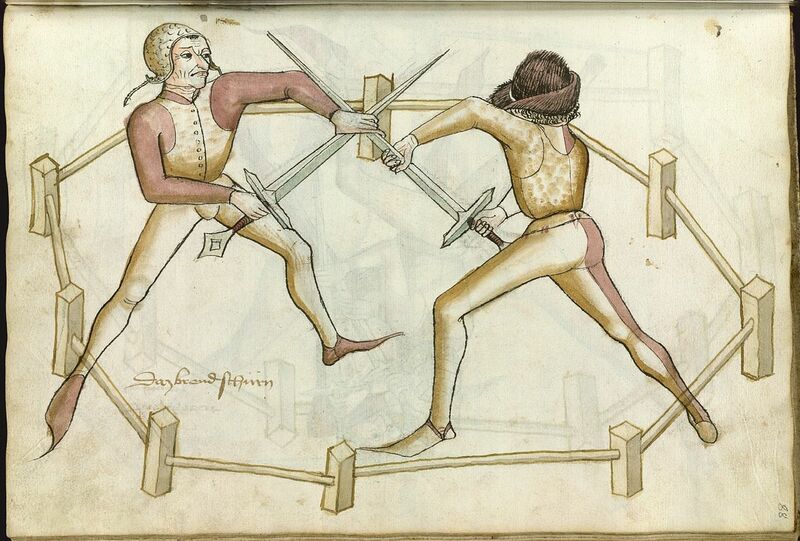 On 86v, the armored man on the right casts his spear, which the man on the left parries. 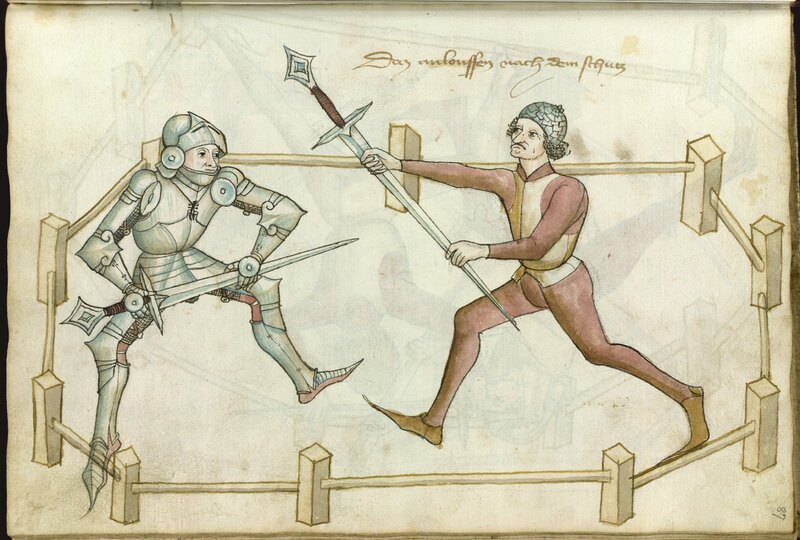 Then, out of nowhere, on folio 87r, the combatant on the right suddenly is fighting in clothing, but is using the Mordschlag (usually a technique reserved for armored combat) to strike his opponent in the head. Folio 86v. Two manly men in armor. Most people tend to assume these images are not meant to be in sequence (even though the very next image, 87v, shows the logical counter to the Mordschlag, although neither man is in armor at that point). 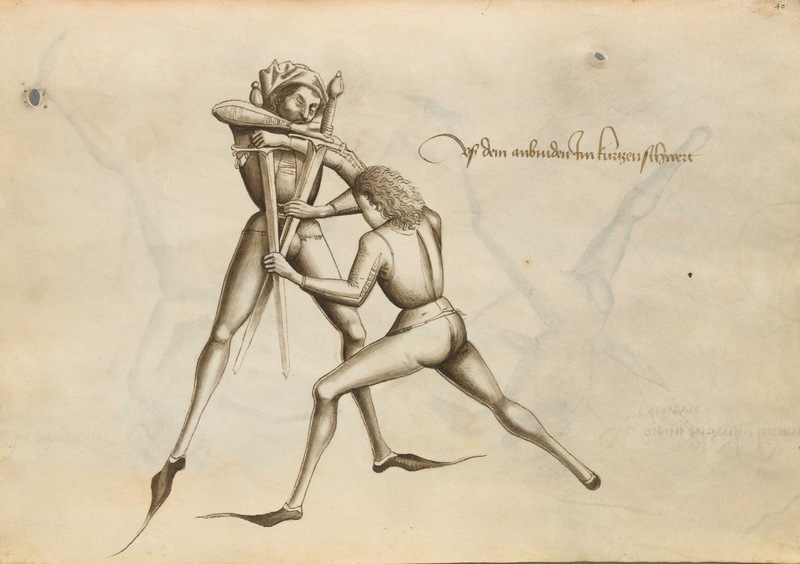 Most believe this is showing combat between an armored and an unarmored man (despite the fact that the judicial duel for men was intended to be done with equally armed combatants). This begs an obvious question: If you had no protection on your hands and arms, but your opponent did, would you shorten the length of your weapon and get close, hoping that your opponent isn’t smart enough to merely back up and outreach your exposed hands with his sharpened weapon? Considering that Talhoffer was a well praised master of his time, it hardly seems right to assume he would advocate something so silly. 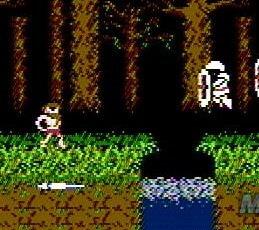 Beyond these images, the rest of the duel is illustrated where neither combatant has any armor, merely their normal clothing (though still using exclusively half-sword techniques, despite the fact that it would be much easier and safer to hold the sword normally when not protected by plate armor). 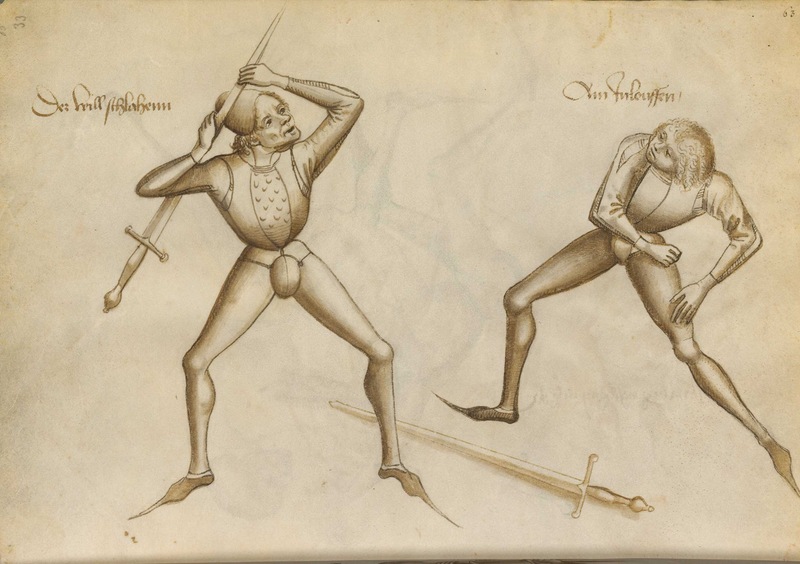 Just as with Talhoffer’s Württemberg treatise above, these too can easily be compared to the instructions of how to fight in armor from other treatises. As suggested above, perhaps the models posed in regular clothing, and the artist drew imaginary armor at first, then switched to what he literally saw for simplicity’s sake. Then what is Talhoffer actually showing? Based on the evidence, the odds are very high that when Talhoffer showed half-sword techniques, most of the time he was documenting armored combat but using unarmored models. 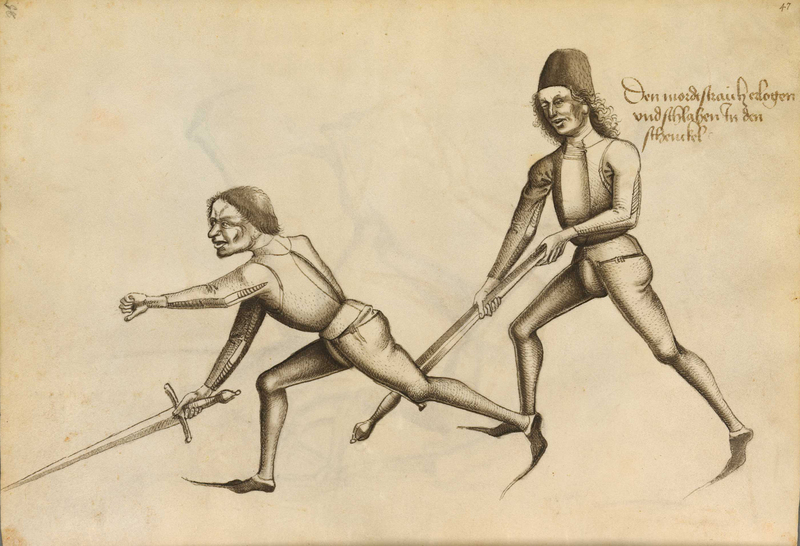 The Württemberg manuscript shows men practicing unarmored techniques in one section, then moving into armored techniques without a change of clothing. If we go with the idea that the models switched techniques but not outfits, and that the artist therefore drew what he literally saw, then the images match the depictions of armored combat from other treatises (and in fact, we should keep this in mind when looking at the “unarmored” poleaxe images as well). Further, the techniques suddenly make much more logical sense. Perhaps the intended audience of these works (whomever they were) found the reason for the lack of armor obvious even if we in modern times, who are removed from the culture, do not. As with everything involving interpreting history, it is important that we do not make quick assumptions on what we see in the treatises. First one must look at the initial source, and then one needs to analyze the context surrounding these sources. In the case of Talhoffer, there are so many detailed fencing treatises from his time that explain so much more, so relying purely on Talhoffer’s images can easily lead to false ideas on what exactly went on during this era regarding the practices of martial arts. However, when looking at the puzzle that is 15th century German combat, it is clear that Talhoffer’s artwork does in fact fit in with the larger picture, and helps us to gain a better understanding of medieval combat. “gewappnet”, do not only means armored but armed, too. In more modern Context it can also mean ” being prepared”, but i can not say for sure that in 15th cent. the word was used in this way. Furthermore the Wallerstein Codex Displays ( the younger section ) displays a lot of halfswordtechniques with distinguished transsitions between gripp at the hilt and half-sword and it is totally in an “Bloßfechten” context.